My newest design, the Margaret Dashwood Shawl, was just published in Interweave's summer 2012 issue of Jane Austen Knits. It uses just two skeins of Brooklyn Tweed LOFT, which is a delightfully airy woolen spun yarn. This colorway is called Thistle. 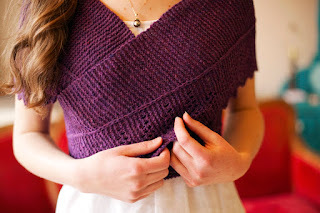 The shawl is worked from side to side and the simple garter and lace edging looks stunning in this yarn. It is such a sweet and simple knit that it is suitable for a beginning knitter. You only need to know how to: knit, purl, slip, kfb, k2tog, and yo to complete it, and there are only two sets of 10-row instructions throughout the pattern. The shawl is long enough to be worn crossed in the back, sonntag style. But it also looks beautiful just draped across the shoulders. I liked making it so much that as soon as I sent it in to Interweave I ordered yarn to make another one. I had a wonderful time being a part of Interweave's second issue of Jane Austen Knits, and loved working with the team on this project. Thank you Deb! I will be working on my second shawl while watching Sherlock this evening! Thanks, Erin. You are nice and early... it won't even hit the newsstands until next month. It will look beautiful on you! It is lovely! I do not have the magazine yet (I'm waiting for the physical version--usually I prefer digital but this one is special) but I know I will be casting on for your shawl when I get it. Thank you. I think I still like print magazines best, too. I look forward to seeing your shawl! It's gorgeous Joanna. Might have to add it to my neverending queue. Thanks, Linda. Tee hee about the neverending queue! I have one, too! Really lovely! I like the Sontag style, how does it stay secured? Thanks Christina! I can't wait to see the print magazine, too! I look forward to seeing your version of the shawl. Happy Knitting! What a nice birthday gift! It sounds like she will be receiving a lovely gift in return from you- that's so sweet! I would love to see a photo when you are finished! Happy Knitting! What a beautiful shawl! I began to knit it just 2 days ago and it is gorgeous an so easy to knit! Thanks, Raquel! I hope you enjoy the knitting, it is such a great summer knit! Hello Joanna, I'm wondering if there is an error in the pattern. I've started the pattern three times and keep coming up a stitch short at the end of Row 3. Is it me? (Most likely - but I can't figure out what I'm doing wrong.) Thanks for any help anyone can provide. Hi Elisabeth, Hmm... let's see what we can do here. Your problem may be happening on row 1. You start by casting on 26 sts. You should have 27 sts at the end of rows 1 and 2. That should give you the correct number of sts to finish row 3. I have seen dozens and dozens of versions of the shawl and also knit it twice start to finish myself so I do believe the pattern is correct. Let me know how it goes! I am having problems with some of the pattern. I really would love to get some help. I thought I was doing it wrong so I took it out twice. I am also new at knitting. When it says K2-1 st inc'd. That just means to knit the next two stitches, right? I want to let you know how much I love this shaw. My daughter wants one just like it, so I am going to make it for her for Christmas. Thank you for having this published. I love it so much. 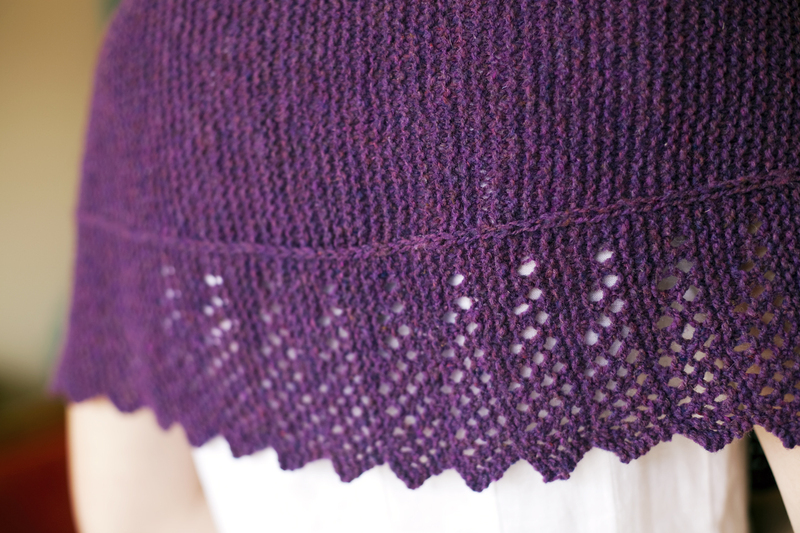 Hi Jenilyn, Thank you for your kind words about the shawl. I hope I can help you out. You finish the row with k2. When it says 1 sts inc'd, that is just there to clarify that you have increased one stitch on this row, not that you increase a stitch at the end of the row.